Marlon Byrd Traded to Pittsburgh on Marlon Bryd T-Shirt Night! Marlon Bryd of the New York Mets is having a pretty good season. There was a 2-3 week time frame where he carried my fantasy team, but with the Mets out of the playoffs (again) they decided to give Bryd a shot at a Wrold Series by trading him and Jon Buck to the Pittsburgh Pirates. Sounds like a pretty good deal for Byrd! 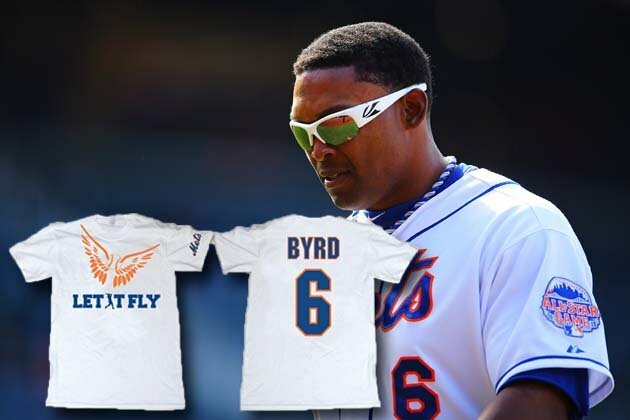 Well come to find the trade happened on the day that the Mets were giving out Marlon Bryd “Let it Fly” t-shirts (see picture below) to the first 30,000 fans to arrive at Citi Field. The Mets are starting to turn into the Jets here, can’t do anything right. Although this has nothing to do with the topic at hand, let’s enjoy a Larry “Chipper” Jones tribute because he was someone who always gave the Mets nightmares!